I prefer the insert collecting method. As mentioned on the Beginners Start Here page there are several methods to the coupon madness. Since I don’t have a lot of time I strongly suggest trying this method out first and then trying other methods if they work for you. I love coupons a lot but I feel clipping them isn’t for me. I like to clip them for my deals and go! 1. I get a couple copies of each Red Plum, Smart Sources each week and then when I have time I will collect all of my coupon inserts for that week. For example: 1/31/10 has 1 Red Plum and 1 Smart Source. I have 3 copies of each. If you only have 1 copy of each just put them in a file folder. 2. I create packets of identical inserts. 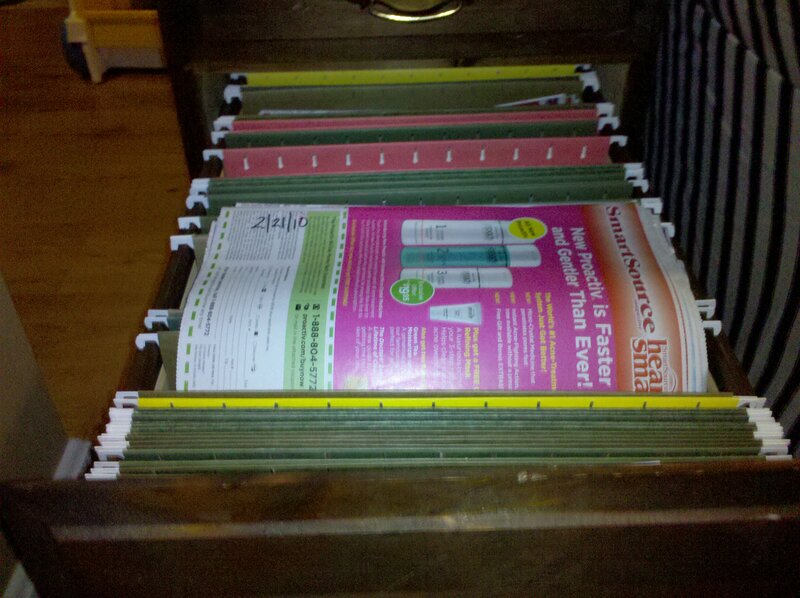 I pull apart the insert and sort them usually on the floor. 3. If there is an insert that I already clipped or someone else did then I place that one as the first insert in the packet. I write the date and the expiration date of the latest expiring coupon in the packet. See the Coupon Schedule for more information. I usually like to keep them to a max of 4 inserts in a packet because if it gets bigger than that it becomes difficult to sort through the coupons quickly. I wrote 4 in the picture above. 5. I like to point out the coupon insert sidebar. This information is really important. If you are like me and get your coupons from different newspapers like the Fairfax Times vs. Washington Post you will notice that the coupon inserts even though they have the same date might not have the same coupons in it. I then make sure I sort them by that newspaper. In this example they are Washington Post inserts. 6. I then take my packets and put them in a filing cabinet and put the youngest packet in the front. I don’t write the dates on the filing folders just on the coupon inserts. Yes, my kitty cat loves coupons too! Who doesn’t? Redberrydeals.com » Blog Archive » How do you organize your coupons?